August 4, 2015 (New York, NY) - Multi Grammy®, Stellar and Dove Award winning gospel recording artist, Israel Houghton and longtime ensemble NewBreed earn number one album on both Billboard's Top Gospel and Top Christian/Gospel charts for current project COVERED: ALIVE IN ASIA. The album also enters the top 50 on the Billboard Top 200 chart. Houghton traveled far east to spread the gospel of Jesus Christ while recording the highly anticipated new album which was released last Friday on RGM/NewBreed/RCA Inspiration. Recorded across Asia in stadiums located in Jakarta, Indonesia, Kuala Lumpur, Seoul, Korea, Tokyo and Manila the remarkable worship experience birthed 13 new tracks offers a look at the global impact of Gospel music. COVERED: ALIVE IN ASIA offers outstanding guest artists including Yolanda Adams on "How Awesome Is Our God," Jonathan McReynolds on "Already Done," and Tye Tribbett joining on "Chasing Me Down." From Africa to Europe and now Asia, Israel & NewBreed continue to expand the reach of their music ministry bringing Gospel music worldwide. "We are pleased as a team that this COVERED: ALIVE IN ASIA offering has been received so well in its first week," said Houghton. "A lot of labor and a lot of love has gone into this project. We thank God for the opportunity to reach people worldwide. Grateful for this honor." 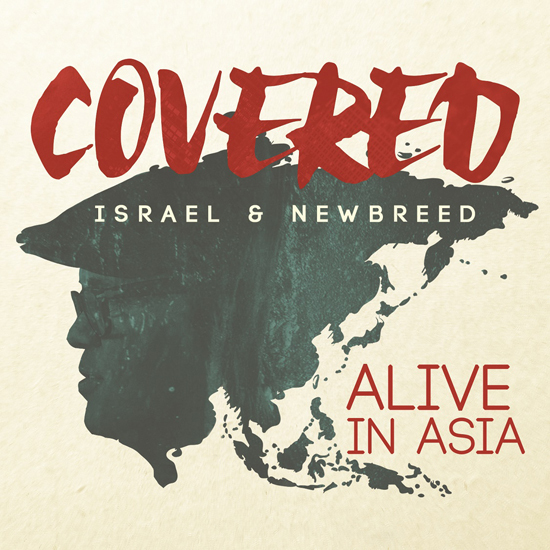 Featuring production from Aaron Lindsey, COVERED: ALIVE IN ASIA will mark Israel Houghton & NewBreed's 10th album together and 15th year anniversary as a group. The project features a 16 track digital deluxe version and limited edition CD/DVD combo pack that includes 13 tracks plus a documentary offering an intimate behind-the-scenes look at the recording process and footage of some of the most beautiful and exotic cities in Asia. Additionally, later this year, Houghton will release a special 90 minute concert film with exclusive performances and interviews. Israel Houghton is prolific worship leader, musician, songwriter, producer and recording artist. His music ministry has spanned 25 years. Houghton is the recipient of 5 Grammy-Awards, 13 Dove Awards, 2 Stellar Awards, a Soul Train Music Award and many more. In 1995, Houghton formed New Breed Ministries that gave way to his debut releases in 1997 Whisper It Loud. Since that time Houghton has released 11 solo and group CD's and has consistently been a commercial success with Billboard chart toppers New Season, Power of One, and Jesus At The Center. He achieved Gold-selling albums with Alive in South Africa, and Live From Another Level. Houghton merged his NEWBREED entity with Galley Molina's RGM (Reverence Gospel Media) creating RGM-NEWBREED Music, a new multimedia and music company. The company released Houghton's Jesus At The Center garnering him his fifth Grammy Award and in 2013 released their second music release, Darlene Zschech's Revealing Jesus. RGM-NEWBREED released their first feature film "I'm in Love with a Church Girl," starring Ja Rule, Adrienne Bailon, Stephen Baldwin and Vincent Pastore, in 2013 marking their first foray in the faith-based feature films genre. RCA Inspiration (formerly Verity Gospel Music Group), is the #1 gospel label in the country that operates under Sony Music Entertainment. Voted Billboard's #1 "Gospel Songs Label" for the past 15 years, RCA Inspiration is the home of mega-gospel artists Donnie McClurkin, Richard Smallwood, Israel Houghton, Marvin Sapp, Le'Andria Johnson, Fred Hammond and many more.